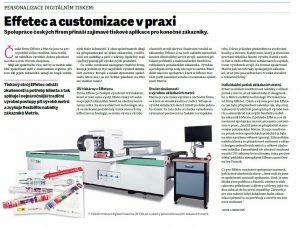 Czech companies Effetec and Metrie are very different at first glance. They are different by the range of products, the duration of them in the market and their target group. But they share more than it may seem. Both companies are based in the Olomouc region, while their customers’ networks reach thousands of miles. Both companies are committed to tailoring customers’ wishes, expanding their supply, and caring for clients. They also have a careful approach to the production of their products. What can come from the collaboration of a traditional company, one of the four largest manufacturers of folding wooden meters in Europe, and a young, dynamic company that, despite its short market presence, has a stable place? 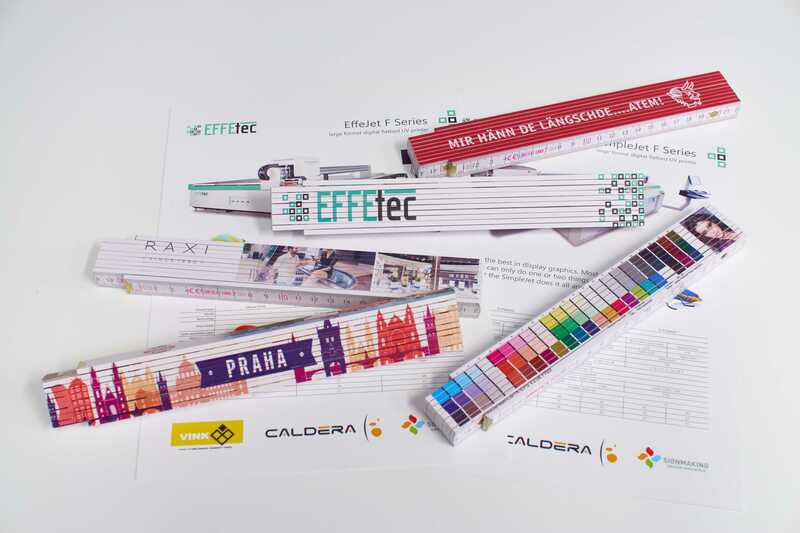 Effetec is a Czech manufacturer of UV printers, which also develops itself. Outside the Czech market, the map of its customers reaches almost all continents of the World. Behind the words of effective technology, which in short form gave rise to the name of the company (effective technology), apart from the development and production of own machines, it is also the building of relationships with customers. Effetec builds on them, facilitates long-term machine servicing, troubleshooting assistance, and superior flexibility to customer requirements. The production and sale of the machine therefore all starts. Effetec is also committed to the relationship with Metrie. Metrie is a purely Czech manufacturing and trading company that combines quality with tradition. He is engaged in the production of folding meters for almost one century. During this time the brand has built a significant position on the Czech and European markets. Emphasis is placed on improving quality and innovation. Every meter that is made goes through several stages of production. Each of these phases requires staff expertise and reliability of production machines. Metrie’s activity is spoken by many satisfied customers, whether individuals or large construction and advertising companies. In order to expand their offer in the area of ​​metro printing, whether in advertising or design, Metria has expanded the UV printing technology from Effetec. 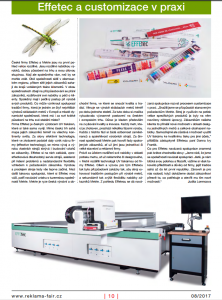 The goal and challenge for the Effetec team was to customize the order to fit the traditional production methods, and secondarily to increase the flexibility of Metrie’s customer base. From Effetec’s point of view, the collaboration can be called the customization process in practice. “We have tried to adapt to Metrie’s requirements. The machine is used to print very specific products (and some modifications have been proposed). Customers of our client bring new possibilities in the design of individual meters and overall enrichment of the offer. 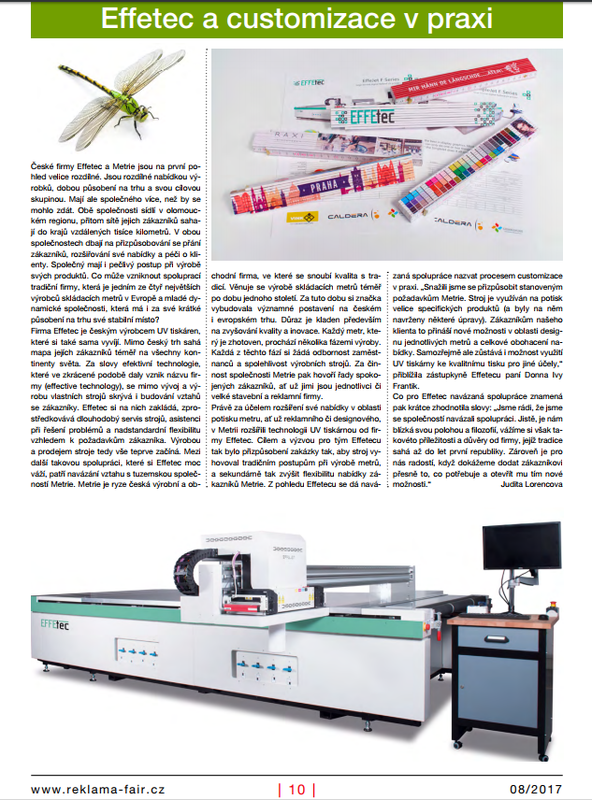 Of course, the UV printer can also be used for high-quality printing for other purposes, “said Mrs. Effetec, Sales Director, Donna Ivy Frantik.